The Solar Airship is like a cross between a hot air balloon and a kite. 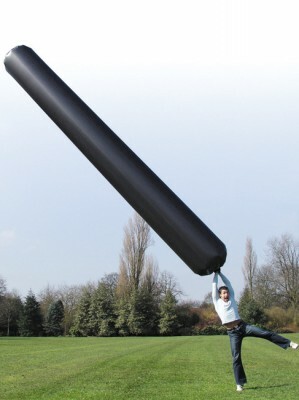 The 8 m long black plastic tube fills with air which heats up, sending it into the air. A 50 M line is attached to tether the airship like a kite. The Solar Airship has been created by the Science Museum. The airship is constructed from heat attracting ‘Absorba’ plastic, this allows the air you have captured within to warm up enough for it to start to rise. The plastic is so efficient at absorbing heat that even on a barely sunny day there will be enough light for the airship to take to the sky. The Solar Airship is supplied with a 50 m line to attach the 8 m long black plastic bag to, allowing you to fly the solar heated air bag as a very large kite. The airship is a great way to demonstrate the power the sun provides us every day, showing its warming effect while also displaying how effectively warm air rises over cold, a great fun science project for children.The airship is suitable for ages 14 + and does require adult supervision. The Solar Airship is around £10, and is available from a number of stockists. I have played with smaller versions of these when i was a kid – that was about 30 years ago.